So, a short ways back, I was doing the 30-Day Anime Challenge. On Day 23, I talked about my favorite attack that someone used in an anime. It was Usopp’s Triple-Bluff against Perona, and while that is certainly still one of my most favorite attacks, it has now been surpassed, so I thought I’d share the update. My new favorite attack is, from One Piece, Usopp’s Special Long-Range Attack: Bagworm! There are several similarities between the Triple-Bluff and the Bagworm: both are from One Piece, both attacks created and used by Usopp, both used only once (thus far), and both against unique and dangerous enemies… both of whom are girls, who are left unhurt, but literally scared senseless. And both attacks are hilarious to behold. Naturally, being so similar is part of how Bagworm became my new favorite, but it’s the differences which nudge it ahead of the Triple-Bluff. While both attacks require knowing the background behind them to understand their purpose and effectiveness, Bagworm’s history can be a bit more streamlined. The target, a girl named Sugar, has a superpower, where she turns people into toys with just a touch of her finger, which both makes them her slaves and erases all memory of them from everyone who knew them. She’s been using this heinous power for at least ten years, if I recall correctly, and with it, she’s helped lock an entire kingdom under the sway of an evil, evil man. She is the linchpin of her master’s dominion, but she has to maintain this system with her every waking thought, and she maintains a demeanor that is practically without emotion. So, if she were to be surprised to the point that she lost control and fell unconscious, her power would be broken. Everyone living under her thumb would be restored. So, a race of tiny people have concocted a plan: they have crafted a grape, because Sugar is always eating them, filled with their super-inhumanly-hot Tatabasco Sauce, which they intend for her to eat, panic as it burns her throat, and make her pass out. Simple plan. It does not go as they want, of course, and both them and their friend, Usopp, are utterly thrashed by Sugar’s slimy bodyguard, Trebol. Having Usopp at her nonexistent mercy, and misunderstanding the purpose of the grape, which she believes to be lethally poisoned, she shoves the fire-hot grape into Usopp’s mouth. In Sugar’s defense, having some schmuck at your mercy one moment, and then coming back up, screaming, eyes and tongue twisting, as a raging inferno erupts from his mouth, would surely surprise pretty much anyone. It would certainly shock me, I know that much! I think it’s perfectly understandable for her to finally lose control of her emotions and scream as she faints dead away. With that, everyone who was suffering at her hand across the kingdom was restored, and thus erupted a chaotic war against her master. However, it’s a grueling affair that takes some time. Before it’s conclusion, Sugar was physically recovered, and posing a direct threat to Usopp’s friend and captain, Luffy, as well as their ally, Law. Another ally, a psychic named Viola, was able to inform Usopp of this, as the man recovered from his own ordeals. If Sugar managed to touch Luffy and Law, it would be all over. They had to do something, but they were far away, and would never cover the war-zone which lay between them, so they couldn’t warn their friends or intercept Sugar directly. What I love most about Usopp is how crafty and resourceful he is. The Triple-Bluff was my favorite for that same reason, but the Bagworm attack is a whole new level of wily. With just what resources and allies Usopp had available, including his arsenal, local materials, Viola’s clairvoyance to guide his aim, and another new ally’s stranger ability to make his drawings come to life, Usopp masterminded a daring, if also desperate, plan to snipe Sugar even from that great distance. This is the second time in this arch that everyone’s fates have lain in Usopp’s hands, as he opposes Sugar. The first time, he succeeded by pure luck, and, honestly, the Triple-Bluff attack did have a little of that. This time, he has only skill, and skill alone. And, another similarity with the Triple-Bluff, the Bagworm attack leaves Sugar completely unhurt. Just psychologically scarred! 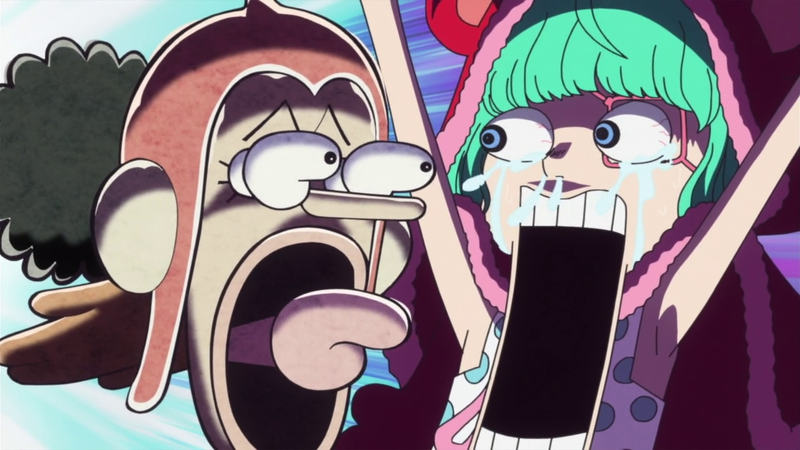 She’s still reeling from her encounter with Usopp, such that anything long, like his nose, makes her panic. So to see an entire replica of Usopp like that, coming straight out of nowhere directly into her face, re-traumatizes her and knocks her out! 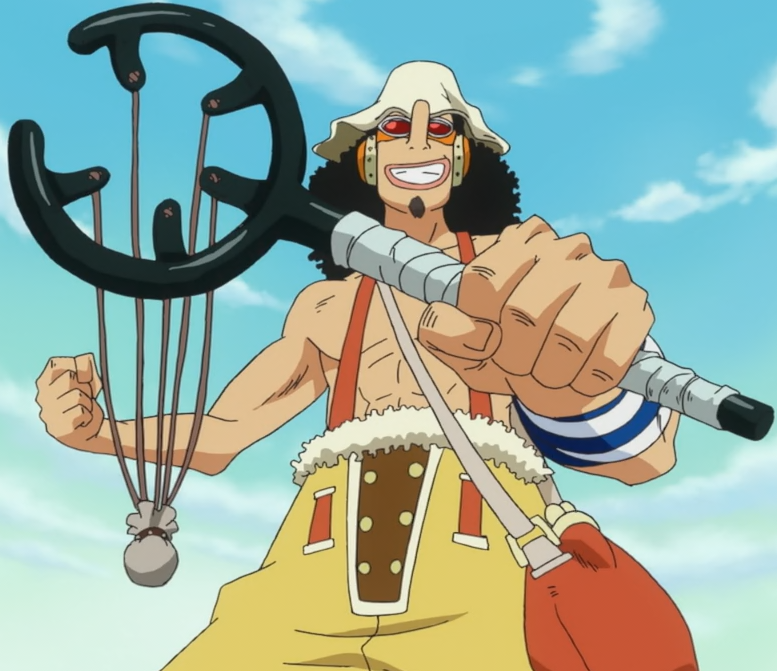 In summary: Usopp has an untenable situation where he must help his friends, with few resources on hand, yet he uses what he has to utmost effectiveness, achieving a superpower at last as he launches it in an inhuman feat of skill across a great distance, taking his previous sniping expertise to a whole new level, all to take down one enemy and save the day with a single, personalized, psychological attack. This entry was posted in 30-Day Anime Challenge, Challenge Accepted and tagged One Piece, Usopp. Bookmark the permalink. Oh my gosh. I certainly agree that Usopp is crafty and resourceful. He’s not the physically strongest nor the bravest in the crew, but whenever he commits to fight, his attacks are well-thought out. The first time I read this attack in the manga, I had to double-take to understand all the mechanics in the attack because it seems so complicated. And I did my victory dance when he finally awakened his Kenbunshoku Haki. That was freaking cool. I just love this series, so thank you for sharing this post with me. If you have other posts about ONE PIECE that you think I’ll like, please don’t hesitate to let me know. And of course, keep on watching anime & blogging. Cheers!